Note: This article focuses on treatment of external poison ivy, oak, and sumac. Before moving to Western North Carolina poison ivy was seldom an issue for me. Since moving here seven months ago, it has claimed me as a victim twice – it’s all over here! That’s good for you because it has allowed me plenty of trial and error to discover a treatment that works. The best treatment is to avoid exposure, but if you’ve already contracted a rash don’t worry, there is hope. Before we get to the treatment let’s analyze several myths so we have a full understanding of the topic. Fact: The rash is derived from urushiol oil secreted from poison ivy, oak, and sumac. The rash is not contagious but urushiol oil can be spread if not removed by washing. Fact: The rash is not caused by the fluid in the blisters, it is a reaction to the urushiol oil. As long as the oil is removed it cannot be spread. Fact: Your allergic reaction to poison ivy can develop, increase, and decrease from year-to-year, even if you’ve never had it before. Fact: Direct contact with urushiol oil is the only way you can be affected. While you cannot catch poison ivy by simply standing near the plants, there is an exception: if the oil goes airborne which can happen in a fire or if the plants are run over with a lawn mower. Fact: This is only true for poison ivy. Poison oak can have between three and five leaves while poison sumac has between seven and 13. Prevent reactions altogether whenever possible by educating yourself and avoiding exposure. 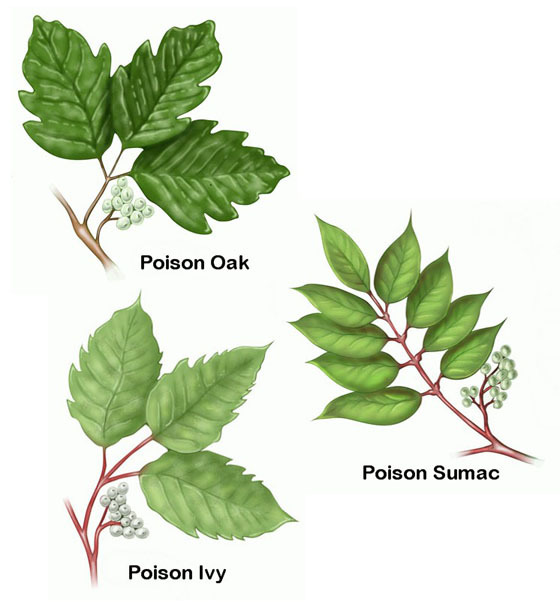 Look at the above photo and be familiar with poison ivy, oak, and sumac so you can identify and avoid contact. Remember that poison ivy always has three leaves, poison oak has between three and five, and poison sumac between seven and 13. When in areas of known growth, wear long clothing. If you do come in contact, using soap and cool water to wash the urushiol oil off your body, clothes, shoes (and any other affected surfaces) as soon after exposure as possible will help you prevent the rash. Using cool water will keep your pores closed and slow your skin’s absorption of the urushiol oil. It’s debatable how soon the oil needs to be washed off to avoid the rash, some say 30 minutes, others say several hours. What is known is that you want to remove the oil as soon as possible. If you already have the rash, read on and try the solution that worked for me, or one of the other solutions listed below. Fels Naptha soap, Everclear ethyl alcohol, and tea tree oil. Note: Fels Naptha has some unnatural ingredients; see list below. If you’re uncomfortable with this soap, don’t use it. An alternative is Burt’s Bees Poison Ivy Soap and I’ve listed its ingredients further down in this article. I use Fels Naptha because it’s better at removing the oil, stopping the itch, and drying the rash than anything else I’ve tried. I have studied the ingredients and know they’re not all natural, but since I’m not leaving it on my skin, I’m comfortable using it in this application (use and rinse off immediately) the handful of times I get poison ivy each year. If you feel different please try a natural alternative. Two ingredients (underlined below) are banned for use in cosmetics but are still used in “leave-on” applications like antiperspirant/deodorant. I would NOT recommend using and leaving on skin. I believe Fels Naptha works so well in this application because it is made to remove oil based stains (like urushiol oil). Ingredients: soap (sodium tallowate*, sodium cocoate* (or) sodium palmate kernelate*, and sodium palmate*), water, talc, coconut acid*, palm acid*, tallow acid*, PEG-6 methyl ether, glycerin, sorbitol, sodium chloride, pentasodium pentetate and/or tetrasodium etidronate, titatium dioxide, fragrance, Acid Orange (CI 20170), Acid yellow 73 (CI 43350). use Fels Naptha soap and water to remove any urushiol oil from any door knobs, tools, surfaces, etc. reapply antiseptic homemade deodorant once every hour until rash dries up and begins to disappear. You should see results within a few hours. Using this treatment dried up my poison ivy overnight! While these treatments were less successful for me, they have worked for many others in the past and may work for you. Many have had success using jewelweed. My experience was that it helped relieve the itch but did nothing to help dry up the blistering rash. Rhus Toxicodendron is a homeopathic remedy commonly taken in 30C dosages of five pellets. I tried this for three days without success. This works great for many but I recommend consulting your Naturopathic/Homeopathic Doctor so you can administer the best individual dosage for treatment. This is an all natural soap that many have success with; I had success using this soap (and applying the homemade deodorant) but the results took three days. 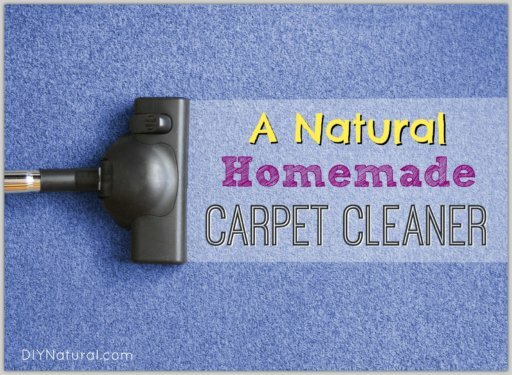 If you are concerned about using Fels Naptha, try this instead. It didn’t work near as quick for me, but was still effective so I encourage you to try it. Ingredients: vegetable soap base, kaolin, avena sativa (oat) kernel protein, melaleuca alternifolia (tea tree) leaf oil, pinus palustris (pine) wood tar, impatiens balsamina (jewelweed) extract. Understand that not everyone will have the same experience. The best solution for you may be different from mine, and different from the next guy. This is normal because we all have different levels of exposure, different skin types, different allergic reactions, etc. Try the treatment that sounds best to you and see if it works. If not, try something else until you find what works best for you. If you have a treatment not listed in the article, please share with the community! We’re in this together and every experience is of equal value. My boughts with Posion Ivy are epic. The worse case I got on my abdomen from a dog brushing against me. I have had it where the sun don’t shine. Technu has helped me greatly but I still usually wind up in the ER at least once a season. For some reason it gets into my system. I am assuming that the medical people mean my blood system and it spreads to ridiuclous places. Something that I have learned since moving to Western NC is that usually you can find jewelweed close to posion ivy. Really useful remedies Matt. I am lucky to, it seems, be immune to this stuff which is a good thing. The folk festival I have attended 26 years now, and many of late as an organizer (where we go to the site for work weekends and such) means I am walking through the woods, usually in shorts, and I must get hit by the stuff. My wife and son however – likely not as lucky. I’ll note this article for when we need treatment. You’re lucky Simon. Betsy seems to be immune to, she has yet to have an allergic reaction. I didn’t read through all the comments but we use sumac tea to prevent and treat poison ivy. Works every time and if I remember early enough in the season to drink the tea, I don’t get it at all. Interesting Megan, do they sell the Sumac tea in the tea section of most health stores? Found this link for DIY Sumac Tea, which is best I’m sure. Thank you all for all this wonderful information on poisin ivy. I was wondering what any of you can tell me about remedies for wild parsnips? I am just getting over a 6 week long bout of this. Second time I have ever had it in my 61 years, and have never gotten poisin ivy ! My acupuncturist had it a month before I went to her. She says it is systemic and would be in my system for min. of 4 weeks. It doesnt itch, just weeps, and weeps ! Thank you for any info you can give me ! I have used colloidal silver myself. I make my own, so it is very cheap. What really seems to work is using the silver with any kind of soap. I put a few drops on the soap to wet it and then rub it on the affected area. Stops the itch for about 3 – 6 hrs & then re-apply. My hubby is extremely sensitive to poison ivy as well. All summer long he has small break outs that travel around his body. He even ended up with poison ivy one year when his parents had a real christmas tree- even though he never touched it somehow he ended up with it. I will definitely share some of the ideas with him. Right now Technu works if he knows he has been exposed. I, like others, am highly allergic to poison ivy. While I have currently only tried an OTC remedy (Zanfel, http://www.zanfel.com/help/) that works great, I will also recommend an quick itch relief of Aloe Vera Gel, it’s cold and takes some of the itching away. Zanfel is unfortunately expensive, but the aloe vera comes in handy. At this point I’ve tried everything from the shots, other OTC creams, steroid pack (which does help when it’s on my face). Plus I get it from everywhere. I know you say it’s not contagious but the oil is easy to spread. I once got it from the dog, who had just came out of the woods in the middle of January! At that point (and even now) I do not go in the woods, or other tree lines. Kinda sad, but I would rather not itch or have the rash near my eyes again! Hopefully I’ll never need the remedies you suggested, but I’m willing to try them! Well the oil is contagious if not removed, to clarify, “The rash is not contagious but urushiol oil can be spread if not removed by washing.” And yes, if the oil is on the dog or anywhere else, the rash will keep appearing until the oil is removed. Most people think the rash itself, and blisters, are contagious, but without the oil they are not. I think you’ll have good results with this treatment Jaime, good luck and let us know how it goes (but hopefully you don’t get it again anytime soon). I am hypersensitive to poinson ivy. If I get a small rash of it anywhere on my body, I will break out in blisters everywhere. Not as intense as the direct contact area but still awful nonetheless. A couple years ago I found the only thing outside of immediate cold water and alcohol rinse that will remove the oil and dry up the rash. TECHNU EXTREEME! It is a cream wash that has gritty pieces in it and releives the itch, drys the rash, and removes the oils. I have to shower with cold water all summer long and must use Technu Extreeme or the Tennessee Valley Death Vine will engulf me. Signed, Fair Skinned Redhead. Thanks for sharing Hero, good to know. Yeah, the poison ivy here in Western NC is engulfing too! Essential oils are very effective. 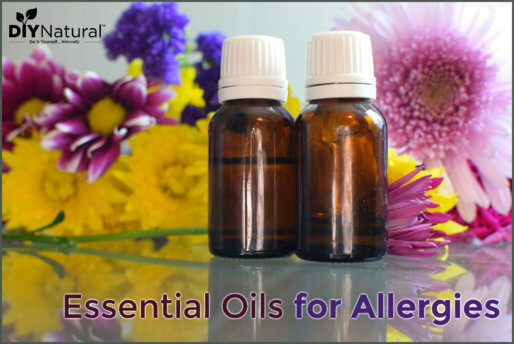 Rose or Lavender are the most effective, you can also use Roman Chamomile and apply on location (just dilute 2-3 drops in 1 tsp. oil before application). Thanks for sharing this valuable information. I am very sensitive to it…to the point of using steroids to rid the reaction. I keep Fels Naptha soap around for my laundry soap recipe. Next time I run into it, I will reach for it instead of the OTC mess that does not work for me. Man, wish I would’ve known this a few days back because for the first time in probably a decade I was stung, three times actually. It swelled up and itched very bad, and 5 days later is still red but almost gone. Next time I’ll be sure to give Plantain a shot. To relieve the pain & swelling of a sting, apply fresh onion cut across the rings – held in place or taped. I used this for a yellow-jacket sting and it relieved it in short order! It also works for a bruise with swelling. This is from a great book, “The Ten Essential Herbs” by Lalitha Thomas. At the beginning of 2012 I moved into a new house so this Spring was a new adventure in finding the poison ivy and poison oak. I had some jewelweed soap and ointment but it was more than 2 years old and I didn’t realize it had lost its effectiveness. It very quickly spread from one spot on my finger to the entirety of my left forearm, my chest, my neck and started onto my ear and face. Had to go to the doctor; one round of Prednizone didn’t do a thing so I had to go for a second one, and prednizone makes me literally crazy and very sick but it had to be treated. It finally dawned on me to order some fresh Jewelweed from AltNatures.com. When it came and a lathered up, I immediately felt relief and within a couple of days, the rash started healing and the horrid itching began to dissipate. What folk don’t always think of is that the oil can get on your bedsheets and spread that way; clothing and towels as well. Now when I go out to work in the yard, I automatically wash down my arms and feet with the jewelweed soap and apply the salve. I have considered growing the stuff myself but have read that jewelweed is horribly invasive so while I am a real DIY-er, this is something it is easier to order online. That is great advice Susi. Great info Anne, have you tried it? I’m interested to hear your results. Dawn dish detergent works also, not diluted works faster. Rub Dawn on rash, leave it on for 10 minutes, rinse first with warm water, rinse again with cool or cold water. Rash clears up within 2 to 3 days. This is not an organic treatment but it does work. Back in the 60’s there was a product called “Ivy Tox”. You put 6 drops of this oil into water and drank it everyday starting about a month before the poison season started. Believe me it worked. I got poison ivy extremely bad. After using this product I did not get poison ivy. Since then this product has seemed to disappear – at least I can’t find any source for it. If anyone knows where to get it – let me know. After a little research it looks like the FDA pulled in around 1993, not sure why. Thanks Matt. It was probably pulled because it worked or because it was a natural product and therefore no one could patient it. Matt, I found this site. I think this product is a lot alike the Ivy Tox I remember. The difference – With the older product you put 6 drops in water and drank it every day a couple months prior to poison season. This newer product you take it once a week for about 2 months prior to poison season then you continue taking it once a month thereafter. It is expensive, but I believe it would be cheaper then buying all the other product after the fact. If this keeps you from getting the rash in the 1st place or very minor then it is worth it. Interesting. The main ingredient in that product is Rhus Toxicodendron, which we listed above. I wonder if Ivy Tox had that, makes sense according to the spelling of the name. We swear by old fashioned lye soap. We buy ours at Silver Dollar City because we are there at least once a year. I’m sure there are other places to buy it as well. We scrub the area with poison ivy until it kind of burns, and then rinse it off. It only takes one or two washings with lye soap before it dries up and goes away.